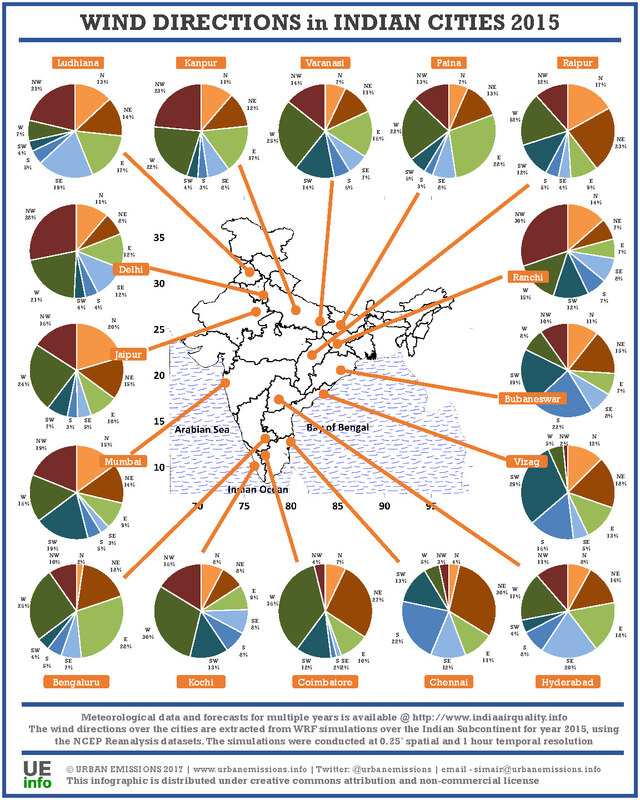 To support India’s air pollution modeling framework, we processed the NCEP Reanalysis global meteorological fields for 2015 through the 3D-WRF meteorological model. We have presented a summary for 640 districts here. The processed data is available for each of the districts as a text file, which includes hourly surface wind speed, surface wind direction, precipitation, surface temperature, and mixing height – key parameters which determine the intensity of dispersion of emissions in the region. An infographic to the right shows prevalent wind directions in 16 major cities and a summary of all the meteorological parameters over Delhi is presented here. We also conduct 3-day meteorological forecast for the region covering the Indian Subcontinent and the National Capital Region of Delhi, updated everyday at ~7:00 PM (India Standard Time). Select a state and a district to visualize the data and download the data as a csv file below.